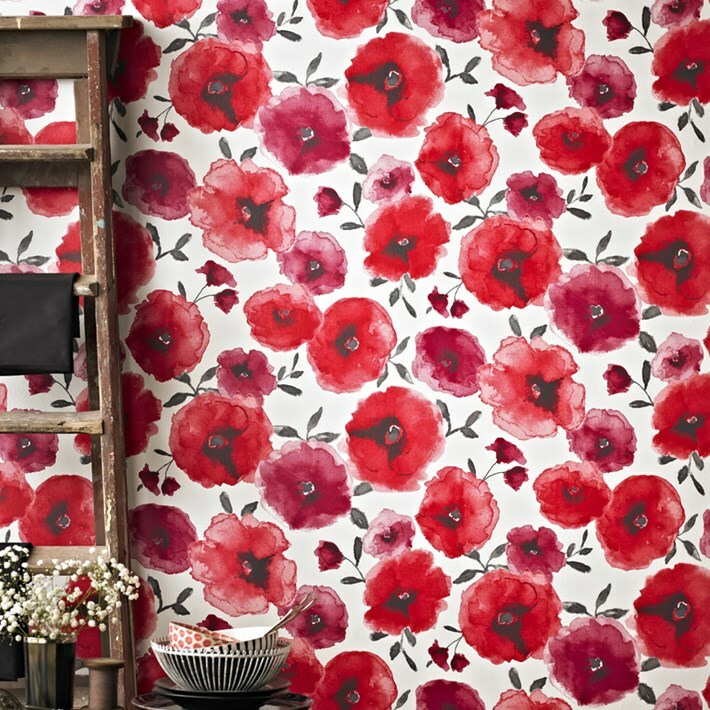 Here at Adorable Home, we love showcasing whole range of exciting new interiors to capture your imagination. 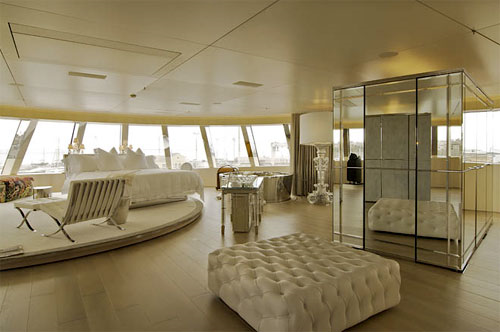 So, today’s feature comes not from a home, a restaurant, or an office space, but from the inside of some of the world’s most impressive superyachts! Widely known to be the most expensive yacht in the world, the History Supreme, which is owned by an anonymous Malaysian businessman was designed by English luxury designer Stuart Hughes. Costing a staggering $4.5 billion, the yacht is covered with over 100,000kg of solid gold and platinum. But it is the master bedroom which exemplifies the no-expense-spared creative design of the History Supreme. The left wall is made from meteorite rock, while the right is an aquarium. Central to the room is an 18.5 carat, $45million diamond which competes for focal attention with a statue made from T-Rex bones! 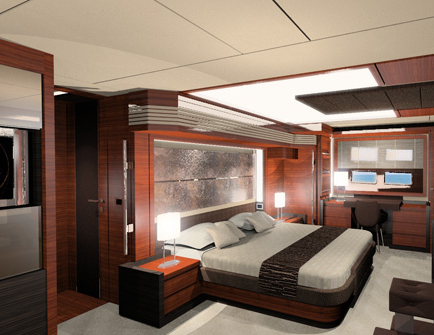 We’re sure you’ll agree that this super yacht epitomizes opulence in its most extravagant form. For something a bit more understated, super yacht owners go to Paris-based Rémi Tessier, who has won numerous awards for his contemporary-elegance which characterizes his designs. 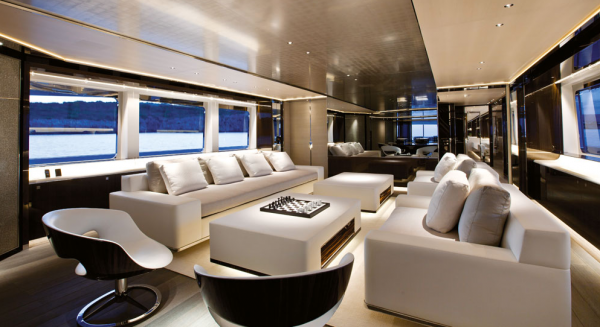 Tessier works on elite interior designs for super yachts, private residences, luxury offices and also offers haute-couture custom furniture. The custom furniture is one the defining features of his designs, which he often combines with innovative lighting and audiovisuals. ShowBoats Design Awards 2012 awarded Tessier’s work on Satori with ‘interior design of the year’, as a result of his clever choices of materials which resulted in a stunning contrast between the neutral tones of bleached and brushed spruce and the more sophisticated woven leather floors and palladium-leaf surfaces. No CEO in history has been more associated with style and design than Steve Jobs. So no list of super yacht interiors would be complete without a nod to his sea-based endeavours. Venus is the 256-foot yacht Jobs commissioned in 2008. The man drafted for the job was Phillippe Starck, the renowned French designer, famed for his interior, product, industrial and architectural design work. With an aluminium exterior and large glass windows, the sleek minimalist style mirrors that which defines Apple. Baccarat-crystal tables, shiny white finishes, polished silver and floor-to-ceiling mirrors reveal the mathematical precision typical of a Starck design. He also makes use of innovative materials to add shape and texture – one room is covered in white sting ray hinds, another features a white circular bed with padded walls. Starck has commented that most megayachts are vulgar statements of wealth and power, stating that with Superyacht A and Venus he wanted instead elegance, intelligence and harmony with the environment. Larry Elllison, the founder of Oracle, started 2013 by giving himself a nice present – a 87.78 meter Feadship built super yacht. When it came to selecting a super designer, Ellision choose Dutch designer Sander Sinot, the final entrant on our list. The design of Musashi subtly blends Bauhaus and Art Deco influences with Japanese style to create a very unique interior. Indeed, Sinot is renowned for his ability to create harmony in spaces through the use of clear lines, innovative materials and careful detailing.